One of the largest membership sites I’ve worked on – which took a year of development – was an extranet. The way to think about an extranet is that it’s a membership site built for a company’s partners. I’ve also worked on several intranets. Those are membership sites that are for employees only. Today they’re no big deal, but when you think about how complicated it could be, especially if you’re connecting it to internal systems, it won’t surprise you if I told you some of those projects have also taken months (or really close to a year). What am I trying to tell you? Simply this. Intranets & Extranets are membership sites too. As you look at the plugins I’ve reviewed all month focused on membership sites, you’ll notice that several have a price tag. But yesterday’s didn’t. And neither does today’s. Page Security and Membership is a free plugin and while you could use it for other kinds of membership sites, I found that I’d recommend it for non-billing solutions like intra and extranets. It’s clean, simple, fast to use, and supports a lot of content protection – especially the whole “lock you out” kind. 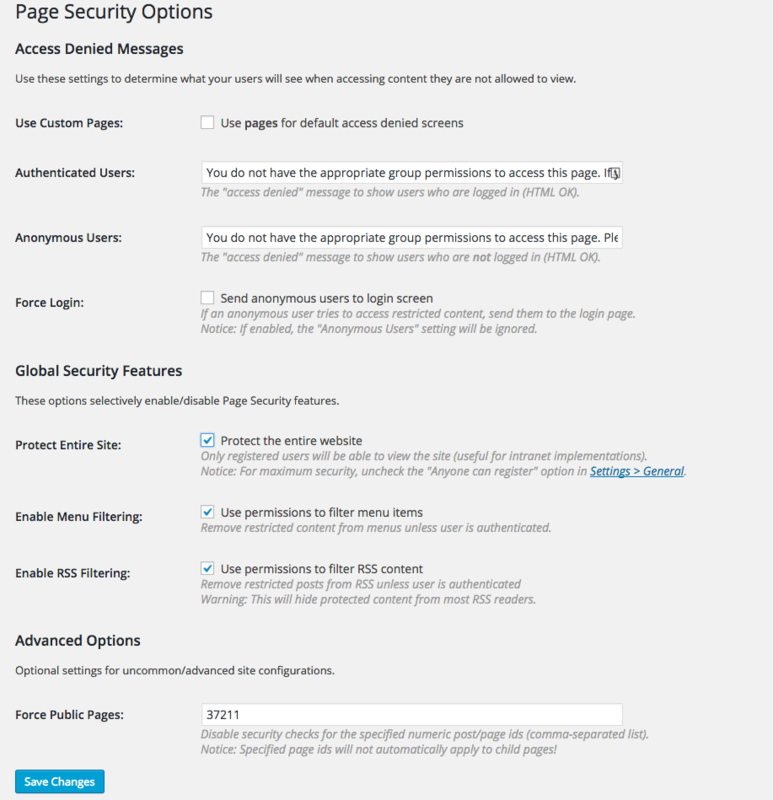 Page Security and Membership is a free plugin that’s great for intranets. If you’re counting, this one is #18. Could you create a full-blown membership site with this plugin? Yes. You’d have to do PayPal or Stripe on your own, to create the subscriptions. And you’d have to put those on unprotected pages, and only route people to some form to register after they’ve paid. Could you do that with Gravity Forms, Ninja Forms or Formidable Pro? Yes, you could. Could you then take those reg forms and create users in groups? Sure. And if you want to do that, instead of picking a plugin that will do some of that for you, go for it. But my take is that it’s a bit more work than you need to do. So the reason you’d look at this plugin isn’t for building paid membership sites – others in our list do that well. You look at this plugin to lock down your site. Presto – you’re done. Intranet is on lock down. The good news is that you can go even more refined after that. For example, in intranets you’ll have only certain people who can approve vacation requests, etc. 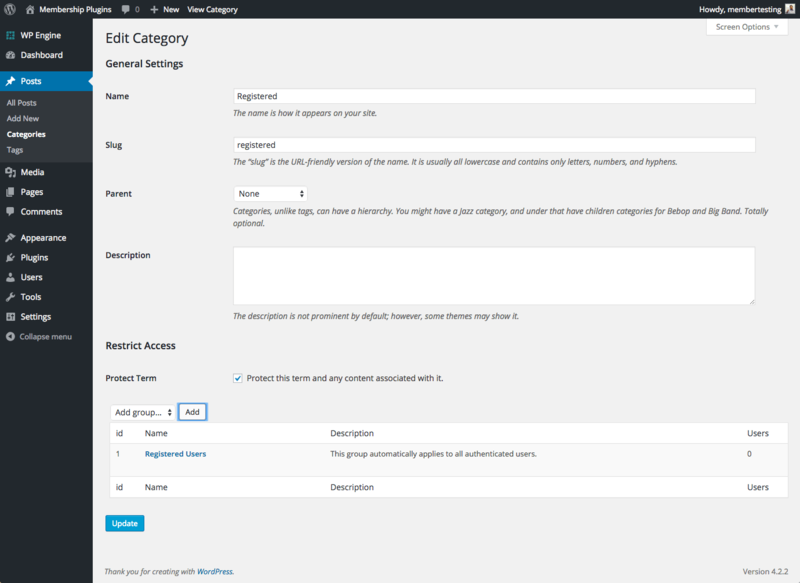 So you put them in a group – a feature of this plugin – and then protect categories of pages (or individual pages/posts) for that specific group. You’ll see that you can easily take groups and link them to categories for that quick protection that everyone wants (and likes). And that’s it. Create a protected and locked down site in minutes. Seriously – in minutes. Wait – is that it? I know, you’re probably thinking – will this be the shortest review post yet? Nope. While I don’t have any more to discuss on the features of the plugin, I should note something about the plugin and the way it’s coded. Just for a second. At some point in these reviews you might have wondered how I was choosing which plugins to review. Maybe you weren’t even sure there were 31 to review. But there are. Even more than that. It delivers great value for a specific use – like intranets. It has over 9,000 deployments so that means people are seriously using it. Technically, it’s doing something different from many others. If you’re not a developer, just focus on the top two and you can skip down to scoring. If you’re a developer, let’s talk a little tech. There are two acronyms that I rarely hear when I interact with WordPress developers when we’re talking about their plugins or code. I’m not talking about the topics when you’re at a bar. I’m talking about the co-working space, or conference hallway when you’re digging into code. And in those scenarios, you don’t hear a lot about either of these. It stands for Internet Information Services. It’s been called IIS for years (including when it started as Internet Information Server). If you don’t already know – that’s the name of the web server that comes with Windows. If you’re a WordPress person maybe you don’t know this but you can install PHP and WordPress on IIS. Seriously. You can. It’s not fun. But it’s possible. But unless you like pain, you don’t do it. Unless you have to. And I’ve been in situations in corporations where you have to. And when you have to, it’s frustrating to simply hear, “don’t do it.” Sometimes you have to. Anyway, I’ll circle back to why I’m bringing up IIS in a second. Let’s get to MVC. It stands for Model View Controller. It’s an approach to structuring the software you’re building. In my humble opinion there is nothing magical about it, but it does help you think clearly about your architecture and approach to the allocation of functions across your code. But again, because WordPress doesn’t use this particular structure, you don’t hear it talked about when we’re talking code. You hear it talk about in religious debates about forking WordPress. But not when you’re talking about regular code. So why are IIS and MVC important? It’s not that IIS or MVC is important on its own. It’s important in terms of what it represents. Starting in version 1.4 of the plugin, now more than 2 years ago, the codebase was completely rewritten. It was put into an MVC structure which makes it easy for developers, even those who don’t know MVC, to predict where to find the code they may want to connect to or adjust. It speaks volumes that a developer wants to make his code structured (using any pattern or approach) and to have it adopt a structure that others – non-WordPress-insiders – might have some familiarity with. In other words, the code is set for other developers to work with. That’s a big deal. And IIS is almost never used. Until it has to be. But if it has to be, many plugins break. They just don’t work. And yet a few months ago, this plugin had a release that focused on better support for IIS. Meaning that they wanted this plugin to work in a lot of environments, even ones that normally aren’t on the top of the list. So why is this important? Because it’s developer speak for thoughtful developers looking to create a solution for other developers to consider, even in some challenging contexts. Who doesn’t love that? Page Security and Membership is written by thoughtful developers for thoughtful developers. As you know, I created my criteria last year. Before I picked these plugins to review. So the criteria is useful and helpful, but where it struggles is where you have different needs than my criteria. So take that into account. If the plugin does what you need, then it’s the right one for you.